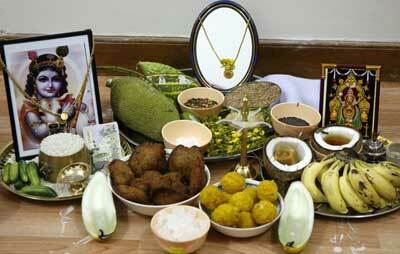 Vishu is a very important festival of Kerala since it marks the greetings of New Year for Malayalees. 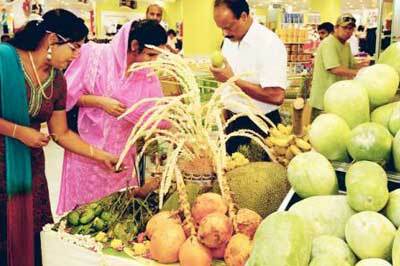 It is celebrated with grandiose in the month of April in the state of Kerala and wherever Malayalees live. Vishu falls on the first day of the month of Medam or Aries and is on the same day of Punjabi Baisakhi, Tamil Pongal, Assamese Ronagali Bihu and Bengali Naba Barsha. There are many things you can do with friends and family on this auspicious day and Yoovite.com helps you in setting up an online invitation or a greetings to your friends and relatives for Vishu Celebrations. The main event of the day is “Vishu Kani” in which you view a Kani, which is the first thing you seen in the morning. The preparation of the Kani takes place on the previous night and is usually prepared with many articles such as Kani Vellarikka (yellow cucumber), a brass lamp, coconut, grains, fruits, gold coins and ornaments, a yellow flower called “Konna” (Cassia fistula) and a mirror in a wide brass pot called Uruli. Viewing the Kani or the Kani Kaanal as the first thing in the morning is very important and because of that people walk with their eyes closed directly from their bed to the puja room where the Kani is kept. The idea is to see good things in the beginning of the year to bring good luck for the rest of the year. Another event is the Kaineettam, where the elders of the family give money to the youngsters and bless them. Further, exchange of new clothes, gifts and wishes to New Year takes place in addition to having “Vishukanji”, which is a special dish prepared on that day. Going to the temple and watching Vishu Kani is also practiced but it is more difficult. The Vishu Kani offered to Gods in the temples is then distributed among the poor. During the celebration, people wear Kodi Vastram (new clothes), sing, and dance and make merry. Padakkam or firecrackers are burst in plenty during this day just like Diwali. Going out on shopping and fairs with family and sending messages on New Year are a part of this festival. The grand Sadya during this day is another attractive ingredient of this festival. Usually prepared by the ladies of the house under the supervision of the elderly ladies, it is a sumptuous meal that features many dishes prepared using jackfruits, mangoes, pumpkins and gourd in addition to seasonal vegetables and fruits. The main feature of this Sadya is that it consists of roughly equal proportion of salty, sweet, sour and bitter items. The major dishes that are popular are “Veppampoorasam” (a bitter preparation of neem) and “Mampazhapachadi” (a sour mango soup).